Homocystinuria is a treatable autosomal recessive disorder caused due to cystathionine b-synthase deficiency which affects methionine metabolism. The reported incidence is approximately one in 100,000-200,000 live births. The clinical features are extremely heterogenous, ranging from mental retardation, ectopia lentis, osteoporosis, and vascular events to individuals with no overt clinical picture. The documented vascular events include pulmonary embolism, myocardial infarction, sagittal sinus thrombosis, deep vein thrombosis, and cerebrovascular accidents. , Hyperhomocysteinemia is a potent independent major risk factor for vascular disease. Treatment to lower the homocystine levels is effective in reducing the life-threatening vascular risk. We report a child presenting with transient ischemic attack (TIA) as the sole manifestation in the absence of any of the classic phenotypic characteristics of homocystinuria. 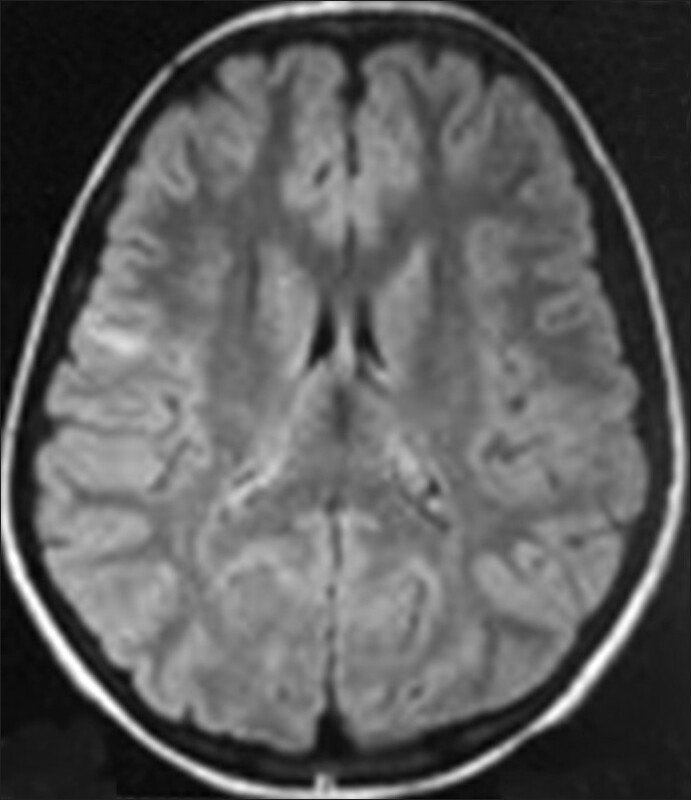 A 12-year-old female, born to a non-consanguineous married couple with normal developmental milestones presented with sudden onset of slurring of speech and weakness of right upper and lower limbs since 3h. There was no other significant history or similar episodes in the past. She was diagnosed with a seizure disorder at the age of 6 years and had taken carbamazepine for 3 years. Family history was unremarkable. On examination, she was afebrile (98.2°F), PR 100/min, RR 20/min, and BP of 118 / 60 mm of Hg. Her anthropometry was normal. There were no marfanoid features or neurocutaneous stigmata. Neurologic examination revealed a conscious alert child (Glascow Coma Scale=15) with motor dysphasia and right hemiparesis. Her cranial nerves, sensory system, spine, and skull examination was normal. Detailed eye examination did not reveal papilledema or lens abnormality. Investigations: Hb 13.1 g/dL, WBC count 12,300/mm 3 (Neutrophils 83%, Lymphocytes 16%) erythrocyte sedimentation rate (ESR) 35 mm, platelets 3.22 lakhs/mm 3 , PCV 38, and normal peripheral blood smear. Her cerebrospinal fluid (CSF) analysis, blood sugar, liver function tests (LFT), blood urea, serum creatinine, serum electrolytes, calcium, phosphorous, fasting lipid profile, and chest X-ray were normal. Her Mantoux test, sickling test, and antinuclear antibody test (ANA) were negative. Her ECG, echocardiography, and color Doppler studies of the carotids were normal. Estimation of phospholipid antibodies (IgM and IgG), cardiolipin antibodies (IgG, IgA, IgM), lupus anticoagulant were normal. Her homocystine levels were elevated i.e. 15.01μmol/L [normal =4.44-13.5μmol/L]. Magnetic resonance imaging (MRI) brain revealed well-defined non-enhancing linear abnormal signal change involving cortex of right frontal lobe measuring 4 mm in thickness and 1.4 cm in length suggestive of an infarct [Figure 1]. Her speech became normal by 3h after admission and weakness of the right limbs disappeared by 6h. Based on the clinical and laboratory results, a diagnosis of homocystinuria was made and treated with aspirin, pyridoxine, folic acid and vitamin B12. She is under follow-up since 5 months without any further vascular events. Thrombotic and thromboembolic complications are the main causes of morbidity and mortality in homocystinuria. , Treatment with vitamin B6 significantly delayed the occurrence of the first thromboembolic event. In a series of 158 homocystinuria patients with 2822 patient-years of treatment, there would be a predicted 112 vascular events if left untreated versus only 17 vascular events with treatment. Treatment to lower the homocysteine levels is effective in reducing the potentially life-threatening vascular risk and therefore, early diagnosis is very important. , The mechanism of thrombosis and atherosclerosis due to homocysteinemia is endothelial injury and stimulation of platelet aggregation. The main treatment goal is to decrease the plasma levels of homocysteine by pyridoxine, folate and vitamin B12. , Kelly suggested screening for homocystinuria in young adults with stroke without a phenotype suggestive of classic homocystinuria. To conclude, homocystinuria should be considered in the differential diagnosis of cerebrovascular events in children even in the absence of classical phenotype of the disease. We recommend screening for homocystinuria in any child presenting with vascular events, thromboembolic episodes, and also as neonatal screening. 1. Alehan F, Saygi S, Gedik S, Kayahan Ulu EM. Stroke in early childhood due to homocystinuria. Pediatr Neurol 2010;43:294-6. 2. Mudd SH, Skovby F, Levy HL, Pettigrew KD, Wilcken B, Pyeritz RE, et al. The natural history of homocystinuria due to cystathionine beta-synthase deficiency. Am J Hum Genet 1985;37:1-31. 3. Yap S, Boers GH, Wilcken B, Wilcken DE, Brenton DP, Lee PJ, et al. Vascular outcome in patients with homocystinuria due to cystathionine beta-synthase deficiency treated chronically: A multicenter observational study. Arterioscler Thromb Vasc Biol 2001;21:2080-5. 4. Mccully KS. The Biomedical significance of homocysteine. J Sci Expert 2001;15:5-20. 5. Yap S. Classical homocystinuria: Vascular risk and its prevention. J Inherit Metab Dis 2003;26:259-65. 6. Magner M, Krupková L, Honzík T, Zeman J, Hyánek J, Kožich V. Vascular presentation of cystathionine beta-synthase deficiency in adulthood. J Inherit Metab Dis 2011;34:33-7. 7. Cardo JE, Pineda MM, Artuch IR, Vilaseca BM, Campistol PJ. Proposed protocol for the study of cerebrovascular disease in childhood. An Esp Pediatr 2000;52:435- 442. 8. Testai FD, Gorelick PB. Inherited metabolic disorders and stroke part 2: Homocystinuria, organic acidurias, and urea cycle disorders. Arch Neurol 2010;67:148-53. 9. Kelly PJ, Furie KL, Kistler JP, Barron M, Picard EH, Mandell R, et al. Stroke in young patients with hyperhomocysteinemia due to cystathionine beta-synthase deficiency. Neurology 2003;60:275-9.